I picked up on Blaise and the work he and his crew were doing over a year ago, initially with their creation of the Seadragon technology which they brought with them when they joined MS research and used it to create Photosynth which continues to amaze and impress me as well. It seems like much of their research is centered around visual computing and interfaces and in my post a few days ago “Seeing is Believing 2.0?” I mentioned two other MS Research projects in this area, Pivot and SecondLight. Today this presentation by Blaise is online from the TED 2010 conference where he shows how they are integrating a lot of technology including Flickr, Seadragon and Photosynth along with some Augmented Reality into Bing maps to enable some amazing new capabilities and possibilities. Watch the video and I think you too will be impressed not only at the technology but with the new level of functionality and value these mashups are driving into maps. It is really the whole area of using location as the grounding context for a huge array of other information and uses. In one of my original postings on Photosynth I suggested/hoped that what we would see next was an ability a bit like a “cosmic zoom” * where we could zoom either up or down almost infinitely. Up into the cosmos of space and down onto not only the street but inside of buildings and then below into the sea. * If you’ve never seen Cosmic Zoom, or it has been a while since you watched this 1968 video/animation from the National Film Board of Canada, I’ve embedded it at the bottom so you can treat yourself. As usual change is occurring exponentially so it looks like Microsoft already has my wish! As you’ve hopefully just seen in the video above Bing maps now provide an inside view capability where we can go from the outside street views into the inside of buildings. They gain this in part by having dedicated “backpack cams” which can be taken inside public buildings and places to provide detailed inside views. But my real excitement is about the ability to “go inside” via all the geo tagged photos from “the rest of us” that are posted to Flickr. This is where the power of Photosynth really shows some promise to me as it stitches together any number of photos by aligning them in 3D space such that we end up with a highly integrated patchwork of all these interrelated photos. This scales extremely well when you think of how many photos there are in Flickr (5,384 posted in the last MINUTE, 2.2 million geotagged the past month) and the Seadragon technology allows this to all happen extremely fast and with no apparent slowdown no matter how images are involved. You’ll also see in the demo how they are able to add in video including a live feed that is similarly aligned within the maps and photos. Imagine when (surely not if) there is the ability to similarly include all the videos up on the web and not “just” photos. As if this wasn’t all more than enough to continue my fascination, it looks like they are also addressing my cosmic zoom up wish as well. At the very end of the video Blaise was out of time but managed to demo an upcoming integration of Worldwide Telescope into Bing maps. I what i thought was a very intuitive implementation you can simply look up into the sky to start seeing the imagery and data of the night sky from wherever you are standing (on the map). As I mentioned at the beginning I think we need to start thinking less about these as “maps” or at least redefine what maps are as we evolve more ways to use location as a central form of context within which we work with an view data, especially visual data. Time is another bit of context and while it is not shown in the video above, because all the photos and imagery is time stamped you can go back and forth in time as well to see what things looked like in the past and then by adding layers on top, Augmented Reality, we can also see future scenarios such as buildings and reconstruction for example. Blaise mentioned in the early part of his demo that they have found examples where Photosynth has included some very old photos and by setting the time back they are able to see the streets of Seatlle with horses and carriages. So as you are thinking about all these new capabilities start to think how this is all part of fundamentally redefining or notion of maps and more so of search, (think spatial) and how we are quickly transfoming from consumer to creators. These and other changes are also tranforming how we find, discover and learn just the right people, things, locations at just the right time. PS. FWIW, keep your eyes on both what’s coming out of MS Research as well as what lies ahead for the increased amount of collaboration between Microsoft, Yahoo, Flickr and Facebook. Thought control is definitely on my What if the impossible isn’t? or WITITT? list and here is a recent addition to the list of examples. I suspect we will do our usual underestimation on this whole area of brain direct or thought controlled interfaces in that we will underestimate how long it will take to mainstream but more so we will underestimate the impact it will have. In any case while it is early in the development don't forget that history shows clearly that adoption and most every other type of change increased exponentially. We therefore need to be thinking of things much sooner than in the past so we we will be ready to adopt and leverage these new enablers as they emerge from the lab and head increasingly quickly towards everyday use by the rest of us. Consider this latest example and start pondering how we will use this to interact with and control our environments and interactions with information, technology and each other. Along with the figure skating, ice hockey and snowboarding, another event will compete for attention at the Winter Olympics in Canada this month. A Canadian company has created what it calls the “largest thought-controlled computing installation.” It’s an experiment that lets visitors to the Olympics use their brainwaves to control the lights at three major landmarks in Canada, including Niagara Falls. 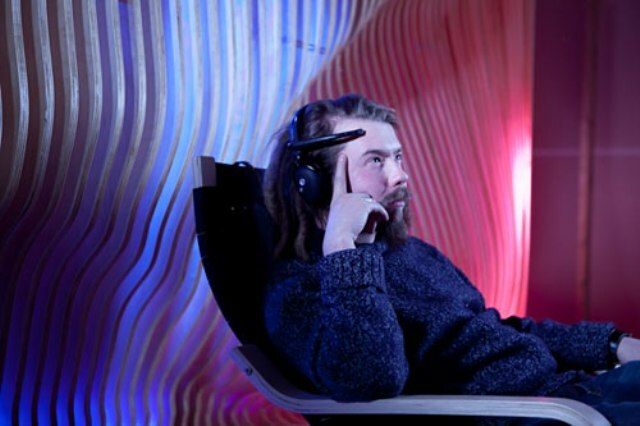 “When people put on the headsets and find themselves increasing the brightness of the lights by just thinking about it, you can almost see their brains explode,” says Trevor Coleman, chief operating officer for InteraXon, the company that has created this installation. As consumers get more comfortable with going beyond the keyboard and the mouse to interact with their computers, companies are looking for alternate ways to make the experience better. Already, touch and voice recognition have become a major part of the user interface in smartphones, and harnessing brainwaves or other biological data is slowly emerging as a third option, especially in gaming. "The advances in DNA nanotechnology keep coming, and many observers are wondering if this will be the path that leads us to the next Industrial Revolution. Only time — and many more experiments — will tell." Until the mid-1990s, the term "nanotechnology" referred to the goal of creating vast arrays of nanoscale assemblers to fabricate useful human-scale products from scratch in an entirely automated process and with atomic precision. Since then, the word has come to mean anything from stain-resistant pants to branches of conventional chemistry — generally anything involving nanoscale objects. But the dream of a new Industrial Revolution based on nanoscale manufacturing has not died, as demonstrated most vividly by the work of NYU professor of chemistry Dr. Nadrian Seeman. Schematics (a) and Atomic Force Micrographs (b) of the Origami Arrays and Capture Molecules. Panel i of (a) illustrates the origami array containing slots for the cassettes and a notch to enable recognition of orientation; the slots and notches are visible in the AFM in (b). Panels ii show the cassettes in place; the color coding in (a) used throughout the schematics is green for the PX state and violet for the JX2 state; the presence of the cassettes is evident in the AFM image in (b). Panels iii illustrate the PX-PX state which captures a triangle pointing towards the notch in the schematic (a) and in the AFM image (b). Panels iv illustrate the PX-JX2 state (a), containing a triangle that points away from the notch, which is evident in the AFM image (b). Panels v illustrate the JX2- PX state which captures a diamond-shaped molecule (a); its shape is visible in the AFM image (b). Panels vi show the linear molecule captured by the JX2-JX2 state, both schematically (a) and in the AFM image (b). If you haven't been following along with all the advances in contact lenses, you are missing out. Efficiency is a top priority in our modern lives and doctors and patients are no exception, particularly when it comes to diagnosing and treating illness. When Grandma, Grandpa, or Billy the kid down the street has glaucoma, they want to have their vision treated as quickly and accurately as possible. And if all this can be packaged with a hint of coolness, that wouldn‘t hurt. Today's addition to my What if the Impossible Isn't (WITII) list and another great example of how the Snowflake Effect of mass personalzation continues to expand. This recent development in contact lenses enables ophthalmologists to accurately monitor how an individual the eyes of a patient with glaucoma are working and personalize their treatment. Here is today's addition to the WITII list (What if the Impossible Isn't?) I've been writing more about AR lately (who hasn't) and expect to continue as both research such as this and infant applications increasingly merge into the mainstream. Glasses and goggles make sense too and may be possible sooner. Implants have additional benefits and applications. This is a longish article, at least by today's online reading standards, but it is well worth the read to get a glimpse at what is currently possible and what is about to be. The latest entry on my “What if the Impossible Isn't?” list is this research breakthrough that takes transistors down to the molecular level, which Privya Ganapati describes in this December 24, 2009 article “First Functional Molecular Transistor Comes Alive” on wired.com. This technology is still many years away from any commercial scale or production, but these kinds of examples are what enable things like Moore's Law to continue long after many "experts" predict it has to come to an end. “Nearly 62 years after researchers at Bell Labs demonstrated the first functional transistor, scientists say they have made another major breakthrough. Researchers showed the first functional transistor made from a single molecule. 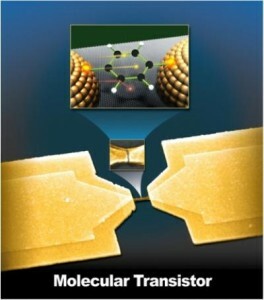 The transistor, which has a benzene molecule attached to gold contacts, could behave just like a silicon transistor. The molecule’s different energy states can be manipulated by varying the voltage applied to it through the contacts. And by manipulating the energy states, researchers were able to control the current passing through it. The transistor, or semiconductor device that can amplify or switch electrical signals, was first developed to replace vacuum tubes. On Dec. 23, 1947, John Bardeen and Walter Brattain (who’d built on research by colleague William Shockley) showed a working transistor that was the culmination of more than a decade’s worth of effort. Vacuum tubes were bulky and unreliable, and they consumed too much power. Silicon transistors addressed those problems and ushered in an era of compact, portable electronics. Speaking of Moore’s Law, I recall back in the early days of modems when the "experts" said that 9600 baud was the physical upper limit of speed. It was simply physically impossible to go any faster. Then they figured out compression techniques, then new transmissions, then optical, and so on. Now we can't even imagine how slow 9600 baud is. Well, I can actually, because I still run at such speeds, sometimes even less, when I'm on my satellite phone data modem, which helps me remember such times, but you get my point. Even when we are so sure, when it is "just a fact", and there seems to be consensus amongst experts, scientists, etc. as to what is and is not possible, we humans have a wonderful history of discovering or inventing a new way of doing things which eliminates or obviates such barriers. This remains more true than ever and is happening at an exponentially increasing rate, which is the real difference to pay attention to. Keep thinking about it. What if the impossible isn't? In the epic battle of love vs. hate, there is a clear winner on Twitter this holiday season. Whatever your beliefs and holidays, I thought this "12 Graphs of Christmas" was fun and somewhat revealing. The one above is my favorite (Love Vs. Hate) since it matches my observations that the more I travel this world, the more I see so much more good than evil.